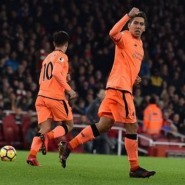 A crazy game took place at Emirates Stadium on Friday as Arsenal and Liverpool tied 3-3 in an affair that turned into a real roller coaster ride for the Reds and was difficult to make sense of. It was a game that Liverpool should have won comfortably as they were cruising early in the second half as they were up 2-0 at the time thanks to Coutinho first-half header and Mohamed Salah’s goal on the counter-attack in the 52nd minute. Although in the 15 minutes before halftime Liverpool completely outclassed Arsenal they could not translate that superiority into goals as their finishing let them down and that ended costing them the win. The reaction by the Gunners should have been expected though as they were booed off the field by their fans after showing very little on the offensive front. Although Liverpool looked secure defensively in the first half, in the second that all changed in the space of five crazy minutes. Between the 53rd and 58th minutes, Arsenal went on a three-goal rampage that left the Reds scratching their heads as they were now facing a heartbreaking loss. Goals from Alexis Sanchez (53rd), Granit Xhaka (56th) and Mesut Ozil (58th) in that frenetic period rocked the game in the Gunners’ favor, however, Roberto Firmino (71st) rescued a point for Liverpool with the equalizer in the 71st. On a positive note, Liverpool extended their unbeaten run to thirteen games as they didn’t just roll over after the debacle, they instead dug deep and rallied to leave North London with a point. Although Liverpool didn’t manage to get a statement win against a tough Arsenal team, Jurgen Klopp will probably be happy the team showed resilience to avoid what would have been a crushing setback. Nonetheless, this can be considered a frustrating night for the German and his squad as Liverpool fans are left to wonder what have been. Liverpool certainly can’t afford to keep giving away gifts like that, especially if they want to finish the year among the top four to once again advance to the Champions League’ groups stage. They can start by winning back-to-back home games against Swansea and Leicester over Christmas to show that they are serious about finishing in that top-four spot once again.